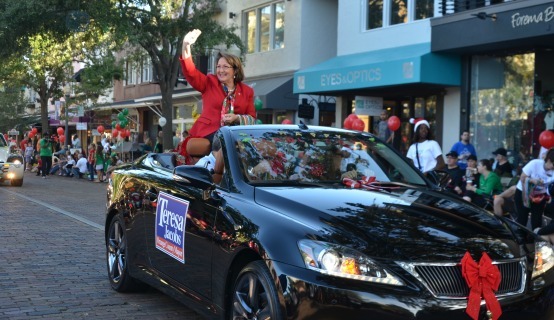 Orange County Mayor Teresa Jacobs and members of the Board of County Commissioners joined citizens at several holiday parades coordinated by the cities of Winter Park, Winter Garden and Ocoee. The City of Winter Park celebrated the 62nd Annual “Ye Olde Hometown” Christmas Parade running through North Park Avenue and West Morse Boulevard. One of Central Florida’s longest running parades, the parade boasted more than 100 participants, including Mayor Jacobs, District 5 Commissioner Ted Edwards, marching bands, dance troupes, floats, local dignitaries and Santa Claus. About 10,000 citizens flooded the streets of Winter Garden for their annual Christmas parade, which ran from South Dillard Street to Winter Garden’s City Hall on West Plant Street. According to the City of Winter Garden, an estimated 65 floats participated in the parade, including Mayor Jacobs, District 1 Commissioner Scott Boyd, Orange County Fire and Rescue and other public safety vehicles and Disney characters. The City of Ocoee also celebrated their Christmas Parade with Mayor Jacobs, Commissioner Boyd dozens of West-Orange area marching bands, civic clubs, scout troops and local elected officials. The annual event started at the intersections of Maguire Road and Enterprise Street, and ended at Municipal Lakefront Park at Ocoee City Hall. The parade, presented by the Ocoee Lions Club in conjunction with the City of Ocoee, featured floats and vehicles that spread holiday cheer for the Christmas season. A collection of photos from the Winter Park and Winter Garden parades and additional photos of the City of Ocoee parade are available on Flickr for use by the media.